There is one huge difference that really confused my wife. She had a 1000 deductible until her insurance would kick in. In my case, I am getting 4000 up front for the year. Once I use up all that money I automatically move to the PPO plan. And yes, I am charged the rates that are negotiated (I am still learning a ton about this plan), but they can change from doctor to doctor. It might be 20 bucks here and 20 dollars there but people are starting to pay attention. BTW, the colonoscopy is a better example than I thought. I had a fellow teacher get 2 colonoscopies by the age of 30 because she was having crazy stomach issues. She found out she had a glutton allergy. She could have shopped around for that colonoscopy and gotten a check in the mail within 90 days. In my case, I am getting 4000 up front for the year. Once I use up all that money I automatically move to the PPO plan. Ok, your plan is vastly different than mine or any plan I've ever heard of. That's great they offered that, but that is not the norm for what most people are getting. As for shopping around, I'm all for shopping around. It has just been my experience that it doesn't really get you anywhere due to the way rates are set. And, I've never heard of an insurance company sending you the difference between what they expected the rate to be and what you were able to get. But, if that's the deal you've got, you should take advantage of it for as long as it lasts. You're surprised a public benefits medical package provides greater coverage and less out of pocket expenses than your private sector one? I don't agree private insurers are the primary drivers of cost inflation in medical care - perhaps in the sense providers know consumers are somewhat divorced from the process so they don't price shop but insurers do negotiate price with providers and theoretically do so on behalf of their clients. I still see the primary cost drivers being technological and consumption based. 1. There have been significant advances in medicine - they have provided significant benefits - we are able to rehabilitate injuries and cure diseases that would left people either partially disabled, in pain or dead decades ago. It's a good thing but it comes with a price tag. 2. Advancements in health care also means you have a larger aging population and they tend to be bigger consumers of healthcare - again a good thing but again this increases healthcare expenditures. 3. Let's face it - as a nation we've become more sedentary and eat less healthy - obesity is an ever growing problem and that drives a lot of healthcare consumption due to the associated health issues. 4. Can't have that cake and eat it to - we can't be a sue happy society and not expect it to show up in the cost of the product in the form of doctor's increased malpractice insurance costs, healthcare providers ordering additional tests to cover their asses and healthcare drug / device suppliers passing costs of class action suits onto consumers by increasing prices. 5. It's expensive to become a doctor (figure at least a $250K for school plus at least $125K in opportunity cost for two years lost wages vs a 4 year degree) - you're in a $400M hole at 25. There is an incentive to get that money back so - treat, treat, treat, charge, charge, charge. A government takeover and prohibition of private insurers wont fix any of this - in all likelihood you will see consumption rise - you know cause it's free so why not go and if your the doctor why not call for more treatment. I agree with your list of cots drivers. I disagree with the conclusion of the impact of a ubiquitous single payer system (which is not quite the same as a "government take over"). 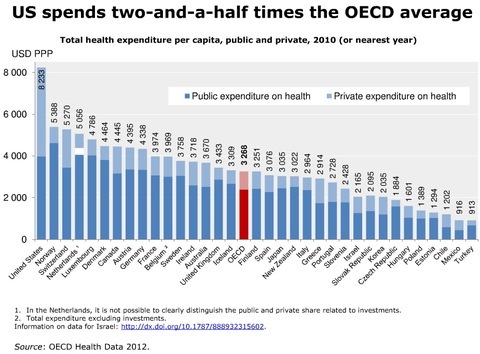 The US spends a whole lot more than other countries do on health care. This chart is from 2012 but things have not changed much since then. This link is from last December and is very current, and it shows pretty much what that 2012 graph shows. We are paying a lot more and we are not getting a lot more. Our life expectancy is ranked at 46th in the world. I realize that a lot of factors go into that number and health care is just one of them (diet, exercise, etc. are huge factors) but the UK came in at 28 and they are bunch of obese, sedentary, drinkers and smokers too. So,clearly something isn't right. Point is - we are not getting value for money here. And, even the Koch brothers' funded think tank concluded that Medicare For All was cheaper than our current system. I agree with you it should not have cost that much. Those numbers are obscene. But, if you had my insurance, or the insurance most people in corporate America have, that would have cost you somewhere between $7,000 and $11,000 out of pocket, depending on your plan. And, you would have paid that money out to about 7,453 different people, each one sending you a bill for about $5 or less, and then the hospitals billing department coming at you like you're a serial killer if you miss even one of those thousands of little invoices - which you absolutely will because they all look the same and are mostly for almost the same amount and you think you've paid it but you haven't. Trust me on this. I've been down this road before. If you want to see just how many charges a medical facility can send get cancer - I filled up an entire binder. And as B&W indicated whatever you have done it seems like everyone from the persons actually treating you to people you passed in a hallway billed you. Howard Schultz is having a Town Hall aired on CNN Tuesday and the far left is absolutely losing their minds and attacking CNN - especially the celeb wing of the D party. They hate this guy and want his silenced - I mean they hate him almost as much as they hate DT. I actually Think he will take votes from both whomever the D candidate is and DT - especially if he does take a centrist position. He doesn't have to pander to the extreme right on issues like abortion / gay rights and he doesn't have go off the cliff in the clown car of the socialist / PC left. I am going to tune. May be we might get someone who drives things back to the middle. I actually think he's going to pull more votes from Trump than he will from the Democrats, but I think the concern is he's going to help get Trump reelected. Well, that's part of the concern. The other part of the concern is he's not going through a rigged primary and, therefore, can't be controlled. And, I suspect that's a bigger issue. I've not made up my mind on him, or anyone else for that matter. And, it is honestly too early for me to start pondering 2020. I like the "zoo" factor to this, but I won't start focusing on who believes, or doesn't believe, what until we get closer to the end of this year. The herd will hopefully start to thin. 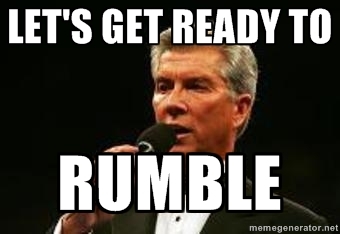 Some of the people who threw their hat in the ring are simply not going to last. Former Mass governor Bill Weld is going to challenge Trump for the Republican nomination. Weld was VP on Libertarian ticket in 2016 that ran the most inane campaign ever - I am completely convinced he does this cash grab. I wasn't overly impressed with Schultz's town hall - when queried on a topic / issue he had plenty of criticism for extreme right or extreme left but few specifics of his position. He also hinted if "the math isn't there" and it appears he will tilt things in DT's favor he won't run. Oh and BTW he has a book out. So maybe he's just pimping his book. I hope he's got more than what he opened with. Harris slept her way in to "public service"
Open borders Beto redefines "empty suit"
And "rising party star" AOC just celebrated the accomplishment of chasing 25M high paying jobs and development out of her impoverished, blighted district. We all better start stocking up on the booze now.